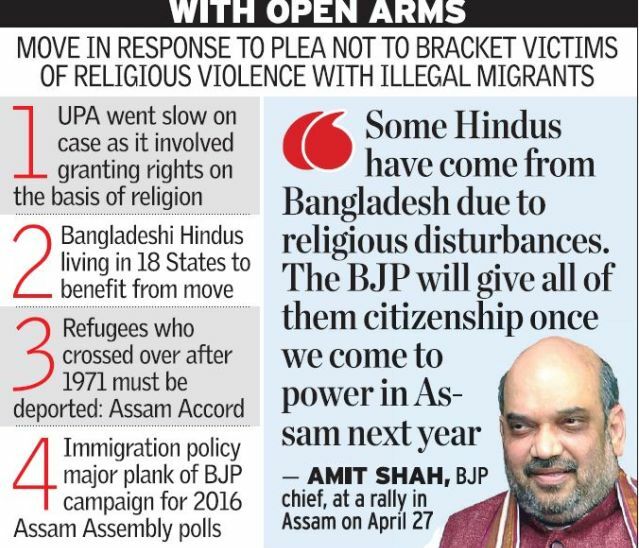 BJP Govt in Center set to grant Indian citizenship to Hindus from Bangladesh. Jayant Sriram | The Hindu | New Delhi | May 14, 2015:: The BJP-led NDA government is set to move forward on the question of granting citizenship to Hindu immigrants from Bangladesh and is expected to submit a policy document to the Supreme Court soon. The document, being formulated by the Home Ministry, will decide the fate of thousands of Bangladeshi Hindus living in 18 States. The Centre is expected to submit the document in response to a case filed in 2012 by two NGOs, Swajan and Bimalangshu Roy Foundation, which pleaded that Hindus and persons of other minorities from Bangladesh migrating to India to escape religious persecution must not be bracketed with illegal migrants and sent back. According to the Assam Accord, all persons who crossed over from Bangladesh after 1971 are to be deported. The petitions demanded grant of refugee status to these persons, which could later be converted to citizenship. It was made clear that the focus of the case was on Assam where animosity towards refugees from Bangladesh is a strong political issue. However, in July 2013, the Supreme Court made the case into a national issue — the Bench hearing the case made 18 States a party to it, observing that the problem of religious minorities coming from Bangladesh to India was not confined to Assam alone. The UPA government was careful to go slow on the case since it involved the question of granting rights on the basis of religion. The files show that since 2012, the government had not filed any official response to the petition and had not even sent a lawyer to attend the hearings. Since the NDA came to power in May last year, it has proactively followed the case and, in the words of one of the lawyers involved, made emphatic assurances that it would resolve the matter. [The report was first published in The Hindu on May 10, 2015]. I marvel at the principled bravery of Modiji. He has taken up Hindu causes where there are no significant votes to chase, these are (1) the plight of Kashmiri Pandits, (2) Hindu refugees from Bangladesh, and (3) the case of the N.E. states, who together send only a handful of M.P.s to the Parliament. It is precisely for these few votes that the Congress kept these causes unresolved all these years, as also because of their general anti-Hindu attitude. …………………. But Modi ji and Amit Shah come out as men of principle, espousing causes which are not fruitful in terms of votes and MPs. ………….. Jai Bharat, BJP ki jai ho! Please Consider Hindus Stranded in Pakistan whose women folks are abused day in and day out. India should Open Flood gates for all Hindus living around the globe without strings attached. Request to Hindu Community around the Globe to SHUNT SHANTI from their life. Because of this SHANTI India lost a lot of area from Hindu Kush Mountains Afghanistan to Bangladesh in the East. Bhikhari and Lutere F..kin Invaders who destroyed Hindu Culture Molested our women and looted our Temples. Wake Up Hindus don’t segregate your self from North South, East west Paradigm. We should stand united otherwise these bloody Muslim bent upon to destroy our Vedic Dharma. Bear in mind As Long as Muslim Pakistan and Muslim Bangladesh exist on our borders they will not sit quiet. Their blood is dirty they eat animals and become animals. Choice is yours. Don’t just read this article? Pass it on. You will do big favor to Hinduism. This entry was posted on May 14, 2015 by hinduexistence in Attack upon Hindus by Muslims, Bangladeshi Hindu Refugees in India, Hindu - Buddhists attacked in Bangladesh, Hindu Genocide in East Pakistan (now Bangladesh), Save Bangladeshi Hindus, Violation of Hindu Human Rights in Bangladesh, Violation of Hindu Rights and tagged Amit Shah, BJP government, Hindu immigrants from Bangladesh, Hindu Migrants, Indian citizenship to Bangladeshi Hindus, Narendra Modi.